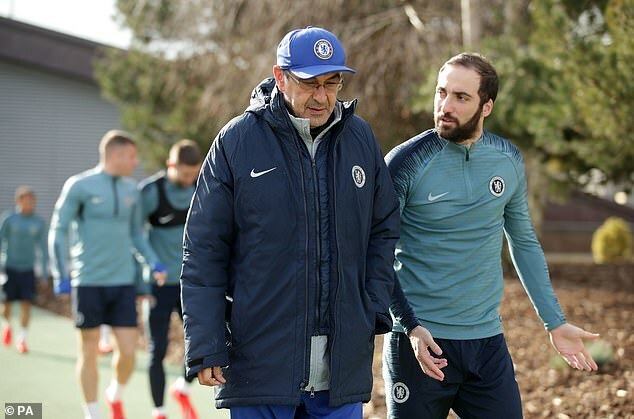 It was business as usual for Maurizio Sarri as he led Chelsea’s training session on Wednesday despite intense speculation over his future as manager. 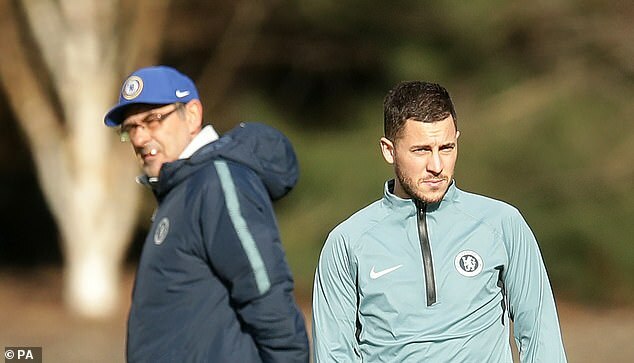 The Blues defend a 2-1 first leg lead against Swedish club Malmo in the last-32 of the UEFA Europa League on Thursday night and Sarri knows he cannot afford anything less than victory at Stamford Bridge. 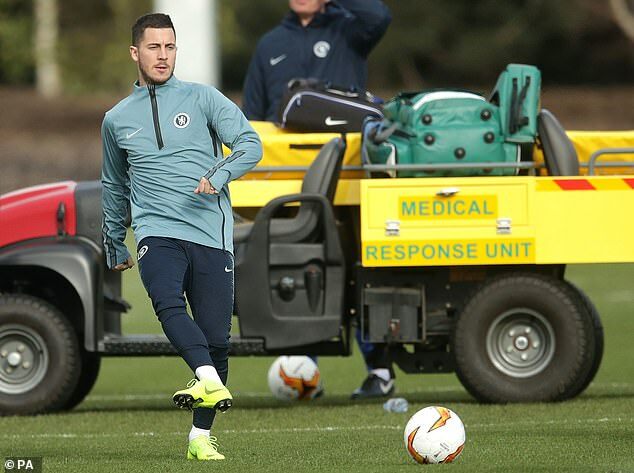 Maybe with that in mind, the Italian was deep in conversation with on-loan striker Gonzalo Higuain as the squad walked out to the training pitches at Cobham. And was Ross Barkley ensuring he gets a full 90 minutes with what looked like a heavy challenge on Mateo Kovacic? The Croatian midfielder was left wincing following Barkley’s tackle from behind, though the Englishman seemed to hurt himself as well. 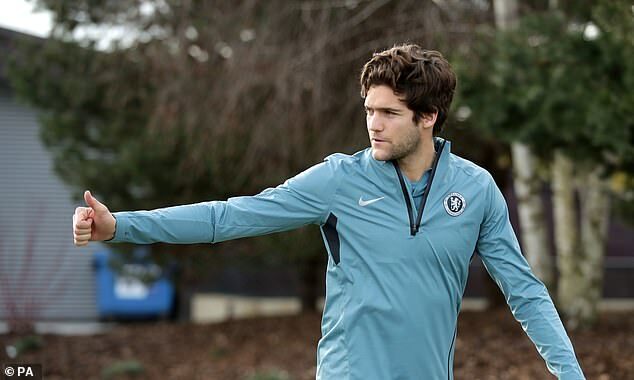 Sarri has decided to replace Barkley with Kovacic or vice versa 20 times in all competitions this season (17 Premier League, two Carabao Cup and one FA Cup). For many fans, it has come to represent an inertia with his ‘Sarri-ball’ tactics that simply aren’t working in English football. 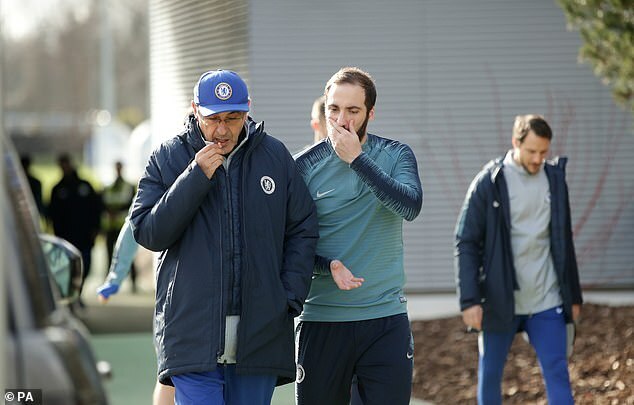 Monday’s FA Cup exit to Manchester United, in addition to recent heavy Premier League losses to Bournemouth and Manchester City, have left Sarri’s job hanging by a threat. Chelsea play City again on Sunday in the Carabao Cup final but first must negotiate the test of Malmo and make it through to the last-16 of the Europa League. With the club currently sixth in the Premier League table – albeit just a point behind United in fourth – winning the Europa League could prove their ticket into next season’s Champions League. Speaking at his press conference on Wednesday, Sarri insisted that a run of positive results could yet give him a long-term future as Chelsea manager despite open mutiny from fans on Monday night. 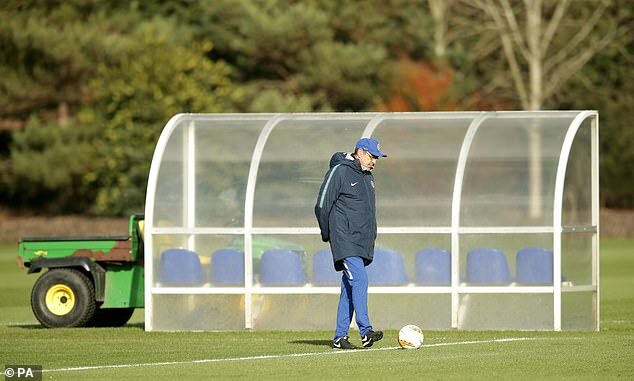 Owner Roman Abramovich isn’t known for his patience when it comes to managers and Sarri could well be on his way after just seven months in the job if they falter this weekend. ‘We need to win three, four matches in a row. It’s the only solution,’ said Sarri, when asked if he can change fans’ views. ‘I can understand very well the frustration of our fans, because they are used to winning. Now we are in trouble, so I can understand very well. 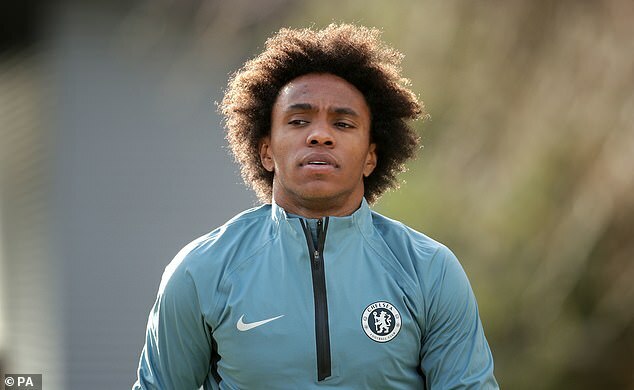 ‘I have to think that I will be the manager of Chelsea for a long time, otherwise I cannot work,’ he added. ‘I am not sure (if I will be here for a long time), but I have to think this. I have to work and I want to work with a long-range target. ‘Of course in this moment it’s very difficult to think we’re able to win three, four matches in a row. As you know very well in football everything can change in one day. ‘It’s not very easy because we have no time,’ Sarri added. ‘We’re trying to solve our problems. It’s not easy. We’re trying to talk with the players, trying to avoid some mistakes by video. ‘The system is a false problem,’ the 60-year-old added.